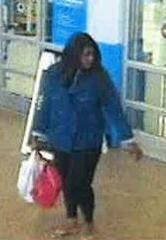 The Burlington Township Police Department is seeking assistance in identifying a theft suspect in the attached image. On April 9, 2018 at 10:03 am the Burlington Township Police Department responded to Wal-Mart for a past tense theft complaint. The suspect is accused to taking $40.00 that was left behind after the unwitting victim received cash back after completed their transaction. If anyone is able to identify the subject in the attached image they are asked to contact P/O C. Zier at either czier112@burltwppd.com or (609) 386-2019.